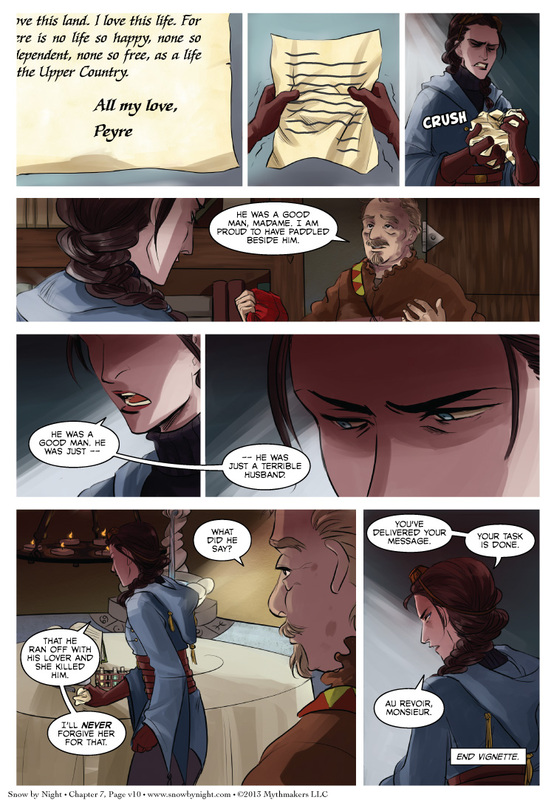 We return to Bertrande and her reaction to Peyre’s letter in Page 10 of A Life So Free. This concludes the vignette. My thanks to Minuiko for illustrating it. She helped bring the scenes of the voyageurs to life. Thank you for all your hard work. She now joins our ranks of our contributors on our About page. We will begin posting Chapter 8 on Monday, Dec. 2. It’s titled Of Making and Unmaking and will be picking up right where we left off in Chapter 7. To see a preview of the great cover page that Brittany did for Chapter 8, please vote for Snow by Night on Top Web Comics. We will not be updating the Almanac on Friday because of the Thanksgiving holiday. Also, this Friday is Native American Heritage Day as the capstone of Native American Heritage Month. Our thanks to the First Nations for being one of the inspirations for Snow by Night. 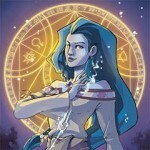 And finally, don’t forget to check out Kaspall, the SpiderForest webcomic of the week. Good stuff over there. Lucy is a talented artist and writer. I wonder, why would she lie about the letter saying her husband ran off with another woman and the lover killed him? Glad to see a bit of background on Bertrande. I would assume the “lover” is his traveling spirit or the rivers or adventure. That’s how I interpreted it. What with his words about how much he “loved” his life out there… and in the end it killed him… he would rather die out there than have stayed with her. She’s saying that he loved his adventures more than his family, and he died for it. I thought the same thing at first, Luci. But after thinking about the language of the letter and rereading Betrande’s words, I realized…she didn’t lie. The rivers were his road, and his spirit why he wandered. But he loved the wilderness, traveling ever farther to reach it. Beautiful it may be, but the wilderness cannot be trusted; it is by nature untamed. It took her husband, even before his death, and she won’t forgive either. So not only does Bertrande see Snow-by-Night as a source of raw materials but she also has a personal grudge against her as an embodiment of her late husband’s mistress. The next chapter is looking even more enjoyable (for us). So, she has a grudge against the native land itself, the North Country is her nemesis, and Snow-by Night is a living embodiment of that wilderness. Oh wait.. BERTRANDE? THAT Bertrande?!?? She looks so different, I didnt realise. But where are the children then? This story takes place in 1664. It’s currently 1687. It’s been 23 years. Her children have grown. We may see them later on in the story. After rereading some of the earlier stuff.. and noticing how almost all of the vignettes are actualy connected to the main story!! was actually the same guy?? That would be… kinda horrific. But you folks drew them as looking significantly different. so I guess not. No, Peyre and the trapper from Snow-by-Night’s story are very different people. Peyre’s love was for the great outdoors, not another woman. That’s why he didn’t see it as cheating on Bertrande. This is my first comment. I loved this vignette! I just read it over again listening to Stan Rogers’ “Northwest Passage” because they both have a great mixture of joy and seriousness, aside from the obvious thematic similarities.